NEW YORK—The current revival of the 1979 Broadway musical continues at the Barrow Street Theatre but it is a somewhat softer and at times, funnier show than when it first opened, which allows for a more well-rounded, if not always as intense, presentation. The reason? 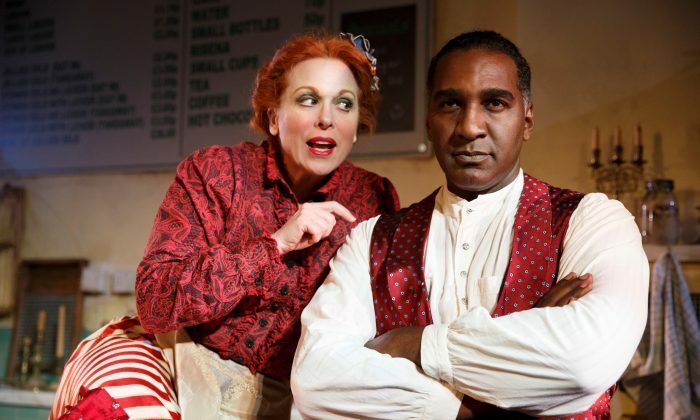 Several important replacements in the cast: Norm Lewis and Carolee Carmello are now in the lead roles. Sweeney Todd (Lewis) was a once-happy barber in 19th century London until he was arrested on a trumped-up charge and sent to a penal colony in Australia. It was powerful Judge Turpin (Jamie Jackson) who framed him because the judge desired the barber’s wife. Fifteen years later, after having escaped his prison shackles, Todd has returned, seeking to learn the fate of his wife and daughter Johanna (Alex Finke). Todd finds his former home is now a shop run by the widowed Mrs. Lovett (Carmello). She sells, at her own admission “the worst pies in London.” Recognizing Todd from the old days, Mrs. Lovett explains that his wife took poison after his arrest, while his daughter had become the ward of Judge Turpin. The judge keeps the now-young woman under lock and key with the help of a local constable, Beadle Bamford (Brad Oscar). Consumed with vengeance, Todd, with Mrs. Lovett’s help, takes up his old trade, all the while planning to get the Judge into his barber’s chair so that he can slit his throat. But before that can happen, Todd is forced to kill Mr. Pirelli (Stacie Bono), who tries to blackmail Todd after learning his identity. The cast does a wonderful job with Stephen Sondheim’s score with its ballads, opera-like-arias and English music hall ditties. While deciding on how to dispose of the body, Mrs. Lovett proposes they use it in a meat pie—a suggestion which appeals to Todd’s macabre sense of justice. Thanks to this new ingredient, Mrs. Lovett’s pies become a culinary delight, and Todd decides to keep the shop well-supplied with a fresh meat as needed. Despite Mrs. Lovett’s wish to simply enjoy their new found success as they move forward, reminders of the past are ever present, which threaten to destroy everything they touch. More than a story of revenge, “Sweeney Todd” is also a social commentary on a time when corrupt officials were able to take advantage of those less fortunate. This premise beautifully crystallizes in the song “A Little Priest.” Todd and Mrs. Lovett take delight in that, for once, the downtrodden will prevail over those above them. Of course, the thrust of the show is a warning against revenge. For when it becomes a single-minded obsession such that nothing else matters, the instigator is in danger of becoming just like those he wishes to destroy. Christopher Bond, in adapting Hugh Wheeler’s original book, does an excellent job of keeping the story tightly focused. Of note, the Barrow Street Theatre has been transformed into a London pie shop (the oldest continually operating pie shop in London, according the program notes), which allows the performers to interact with the audience as they move about the venue. Bill Buckhurst’s direction is pitch-perfect here, with an ever-rising undercurrent of tension present. Norm Lewis plays Todd somewhat differently than Jeremy Secomb did, who originated the part in this production. Where Secomb gave Todd a maniacal air throughout, Lewis presents him as a more tragic and thoughtful presence. His desire for vengeance builds more slowly until it finally explodes. It helps that Lewis and Carmello, who does a very fine turn as the duplicitous Mrs. Lovett, have an excellent sense of timing, allowing some of the more comical moments to really shine. This is particularly evident in Lewis taking an extra second to respond to some of Mrs. Lovett’s comments, the two milking these moments for maximum effect. Jackson makes a nicely arrogant Judge Turpin, complacently secure in the knowledge he is completely above the justice he dispenses to others. Oscar offers an ominous air as Beadle Bamford. Finke and Doyle are delightful as Johanna and Anthony, the only truly innocents in the story; at least in the beginning. Stacie Bono offers a nice bit of menace as Pirelli, and an aura of mystery as an old Beggar Woman. The cast does a wonderful job with Stephen Sondheim’s score with its ballads, opera-like-arias and English music hall ditties. Among the highlights is the haunting “Johanna,” sung by the ironically named Anthony Hope (Matt Doyle), a young sailor who falls in love with Todd’s daughter. Other strong numbers include the wistful “Pretty Women” sung by Todd and Judge Turpin; “By the Sea” sung by Mrs. Lovett as she dreams of a better life; and the haunting “The Ballad of Sweeney Todd.” The musical accompaniment provided by an excellent orchestra of three. A dark and fascinating journey, this production of “Sweeney Todd” takes what is essentially an epic story of power, loss, and revenge and reduces it to something quite intimate—all without losing any of the elements which made it so compelling in the first place. Also in the cast is John-Michael Lyles.